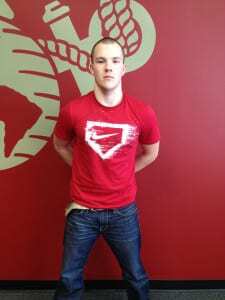 Levi Scott Smith, son of Sandra & Edward Smith and a senior at Hilltop High School in West Unity, recently enlisted in the United States Marine Corps Delayed Entry Program. This program allows high school seniors in the Marine Corps and defer going to recruit training until after graduation. During recruit training, Levi will learn military customs and courtesies, first aid and a variety of military related subjects designed to create the moral discipline required of all Marines. After graduation, new Marines learn their occupation specialties at formal schools and gain further knowledge from on-the-job training. Levi was enlisted by Sgt. Chester from Recruiting Substation Wauseon, located at 1230 N. Shoop Avenue, Wauseon, Ohio 43567. For more information, please call 419-335-5880. Be the first to comment on "Hilltop Senior Enlists In United States Marine Corps"